Milk Junkies: Proud to be a New La Leche League Leader! In 2014, La Leche League International changed its policy about the eligibility of Leader (volunteer) Applicants to be inclusive of all gender identities. As a result of the rule change, I was able to apply, and I went through La Leche League Canada’s (LLLC) thorough and fantastic training, becoming accredited as a Leader two weeks ago. I am grateful to the Leader who supported me and spent many hours answering my questions, and to the Leader at the Accreditation Department who guided me with patience and kindness and kept me on track. La Leche League is the world’s best breastfeeding peer support organization – this was the reason I wanted to become a Leader when I first asked about applying, and it is why I am so proud to join other Leaders in serving breastfeeding families. Leaders assist more than 20,000 families across Canada each year, using carefully compiled resources. I feel I truly found my community when I found La Leche League. LLL is one place where I know I will be accepted with my breastfeeding toddler and where my nursing relationship with my child will always be valued. In fact, I believe I have felt more criticism around nursing an “older”* child in public than for nursing as a man. And that really speaks to why we still desperately need LLL, and why it was founded sixty years ago. We need to continue sharing information and resources around breastfeeding and the breastfeeding relationship with those who come in search of support in the context of a culture that continues to marginalize breastfeeding. * “older” is in quotes, because we are talking here about anyone over the age of one. But let’s face it: two- and three-year-olds are simply not “older”! Trevor, as a retired Leader, I was really disheartened to see your post with the rejection letter (I experienced questions about suitability as a leader because I returned to work and provided pumped milk for the time my daughter was in childcare while I worked), you will be a fantastic support, advocate and educator for breastfeeding/chestfeeding parents. And you are not nursing an older child, two and three year old are not older, you are being a role model for nurturing and meeting the needs of your children. I am so happy to read that you found your community in La Leche League. That is exactly how I felt in 1985, when I needed not just breastfeeding information and support but also support in becoming the kind of nonviolent parent I wanted to be. The few years I spent as a retired Leader made me realize all over again how valuable La Leche League is in my life, so I reactivated in 2009. I look forward to reading more from you on the FB group. Congratulations on your accreditation! A woman pretending to be a man giving breastfeeding lessons. Sorry, but I'm not going to play along with your pretend-play. I feel sorry for the child. I agree. It is so sad for the child when the parents are so confused. When it is very politically "correct" to believe all the unreal nonsense that happens today, it can't help BUT harm the children! I remember when La Leche League was in favor of doing things NATURALLY. How on earth is giving the mother artificial hormones and subjecting her to mutilating surgery in the best interest of the baby? Our foolish society has become enslaved to such nonsense! Worry about what your own families do. Trevor can worry about his own family and what he does with the incredible knowledge he has gained over the years nursing his children. He's no less qualified to support nursing parents than anyone who has been through the training and has first hand knowledge. How wonderful his children come from a loving attached home. How open and grounded their hearts will be! Trevor thank you for always being so open with your life. Even though trolls have found their way in. his kids are happier than most. they have parents who love them. they are very kind people, gentle, and honest. as a person Trevor is approachable with even the most sensitive topics. I hate to see you talking about the use of hormones as being some terrible thing. many people have needed hormones or other treatments to carry a pregnancy, you have just dawned the lot of them. others need hormones to breastfeed, or want to produce milk after partial mastectomy or breast reduction. 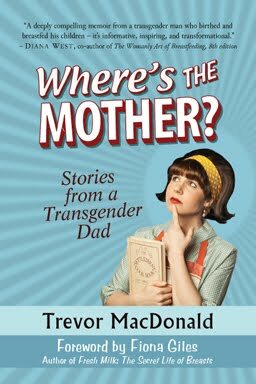 what any parent needs to birth and feed their child is none of our business and that goes way beyond trans dads. take your disgusting attitude and stick it. I for one am glad to have met a person who is so non-judgmental and open. Thank you so much for sharing your experiences and knowledge with others. We are lucky to have you around. Back in the 80'S I was a La Leche League leader and have since transitioned. I remember the time proudly and I am so happy to have been able to experience breast feeding, not to mention giving birth. La Leche League was invaluable to me. I am so grateful for it to this day. Now I am a grandfather of a 14 month old. He is nursing and also eating everything and wonderfully active, happy and healthy. Congrats to you, man.